Situated in Playacar Phase 1 and just a 2 minute walk from the picturesque white sand beaches of the Riviera Maya, Casa Cielos is a tastefully renovated 3 level home offering a beautiful terrace on each floor. 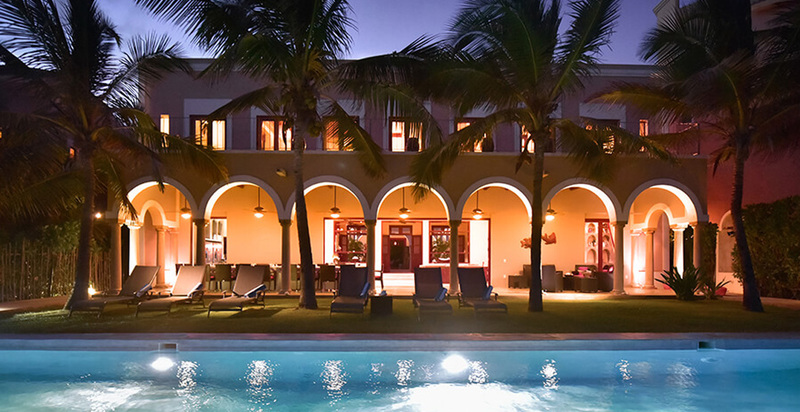 Casa de las Palmas is a stunning full-service vacation rental on Tulum Beach. Our because rental home has three bedrooms and sleeps 8. Villa Verde is a new luxury home located in the eco-conscious Aldea Zama neighbourhood of Tulum. It has 4 bedrooms, modern clean lines, an open concept design and private 15m lap pool. Naiik, meaning Casa del Aire in Maya, is a chic contemporary oceanfront oasis offering 4 luxury bedrooms, settled alongside the pristine Sian Kaan coastline and lush tropical jungle. Casa Cantarena is one of our newest beachfront Villas with great open space architecture, created in Mayan contemporary style. Its special design focuses on keeping the harmony between modern and eco- conscious living given its pristine location inside the Sian Kaan biosphere, a UNESCO heritage site since 1987. Located in the Boca Paila Section of the Sian Kaan Reserve, a UNESCO World Heritage Site, luxurious Casa Maya Kaan is situated on one of the most pristine and beautiful beaches in the area. The home is exquisitely designed for groups of families and friends who want to get away from it all. Al Cielo Penthouse Punta Roca 402, Puerto Aventuras is an amazing and luxurious home with 4 ensuite bedrooms! A huge private roof deck offers a Jacuzzi, chaise lounges, al fresco dining, gas bbq grill, sitting area boasting incredible ocean views! With daily housekeeping and complimentary continental breakfast (Monday to Saturday). Feel the sun and gentle ocean breeze as you relax on chaise lounges in front of the Mexican Caribbean... Welcome to the stunning Hacienda Quinta Del Mar, Puerto Aventuras! An upscale luxurious hacienda style villa with 4 suites plus den! You will be enchanted by Casa Encanto, a gorgeous 4 bedroom home in Playacar Phase 2, Playa del Carmen. The spacious Casa Encanto located within lush tropical gardens is decorated in a contemporary, warm and artistic style. Beach House is a chic contemporary oceanfront private oasis offering 4 bedrooms in the exclusive gated community of Playacar. This vacation home will provide luxury, comfort, relaxation and location on one of the world’s finest beaches! Enjoy the soft, white coral sand and crystal clear aquamarine waters of the Caribbean Sea. This is your front yard. CASA IKAL is a new stunning beach front villa inside the biosphere reserve of Sian Kaan, a mile north of Boca Paila bridge and 20 mins away from Tulum; the Caribbean beach-front brings you to a rich coral reef at swimming distance and the lagoon front goes directly to ancient Mayan canals, one of the most spectacular and exclusive places on earth! Casa Jaguar is a beautiful 4 bedroom/4 1/2 bathroom residence located on the main avenue in Puerto Aventuras, Riviera Maya. Contemporary style, luxurious finishes, elegant decor and high security system are some of its main features. Welcome to Kite House, Playa del Carmen’s newest and most exclusive villa offering complete privacy while just steps from the amazing stretch of pristine white sandy beach. Our beautiful beach house is 4 acres private property with 600 coconut palms and hundreds of different tropical plants with full time gardener and housekeeper.The house has 150 feet of oceanfront. It is divided in two Palapas, which are connected by an open wood bridge beautifully decorated. Casa Palapa is an eco chic beachfront home completely open to the caribbean breeze with mexican colorful touches. It embodies a grand suite on top; a two bedroom suite and a double room on the ground level. This lovely Mediterranean, 5,000 square foot home, sits across the street from one of the most beautiful beaches in the private resort community of Playacar Phase I.
Casa Nalum sits on one of the nicest beaches worldwide, gazing across the sea with gracious open spaces and generous grounds for reading, relaxing or sunbathing, this Villa offers complete privacy with high-end service only 10 minutes from Tulum's restaurants and night-life. Casa Nikki is a charming privately-owned villa in the exclusive gated residential community of Playacar Phase 1, in the heart of the famous Mayan Riviera. A seed is something that you nurture and love — it blossoms right before your eyes into something extraordinary yet unbelievably simple. El Dorado Villa Maroma is the perfect destination for a true luxury getaway. This adults-only Villa provides supreme amenities, impeccable service, and unparalleled dining experiences. Let your Majordomo take care of your every wish as you lean back and enjoy the tropical breezes of the Riviera Maya. Amara is right on the beach. You’ll love it because of the beautiful views, the location, and the outdoors space. The house of ponds, the rough translation of the name ‘Villa Los Charcos’, is an amazing statement of Mediterranean style architecture nestled among lush tropical foliage and immaculately kept properties. With white sand beaches only steps away, guests can unwind and enjoy sophisticated luxury with the rich flavor of the Riviera Maya. This amazing new villa is the very definition of residential opulence. – Ideally situated in the exclusive private Playacar Phase 2 region of Playa del Carmen, Villa Marmol is a brand new, ultra spectacular luxury villa designed to satisfy even the most discerning tastes. Zacil Na exemplifies private paradise. Holder of award winning architecture, this luxury 5 bedroom villa has everything to get away from the every-daily life. Wake up with an ocean panoramic view that will enchant the eyes with its electric turquoise color. Alcanzar De Playa, " The Fortress," is a custom-built home located in Playacar, a resort community adjacent to the Village of Playa del Carmen, Mexico. Set at the edge of a tropical jungle, in between the trees and under the moving shadows, Tulum Treehouse is a collaborative space the brings together design with the artisanal traditions of the Yucatan region. Set on an idyllic white sand beach, Azul Villa Carola is a 10,700 square foot, two level haven with 6 bedrooms, 6 full bathrooms, oversized private pool, outdoor Jacuzzi, dedicated staff and a multitude of services and amenities, which start upon arrival with a welcome glass of champagne presented by the Villa’s private Majordomo. Our new gorgeous beachfront Villa that has over 14,000 square feet of pure luxury. This beautiful Villa offers 6 full bedrooms, living room with beautiful contemporary furniture, a family room, home theater with state of the art Bose sound equipment, spectacular Beachfront pool and to top it off your own Spa and Gym facilities. Villa Albatros offers luxury accommodations. Here where the Maya civilization embraces the blue and turquoise waters of the Mexican Caribbean, vacationers can revel in an incredible blend of colonial charm and outdoor activities. The combination of the villa's unique architectural design built on different levels will provide well-being, peace, relaxation and privacy. 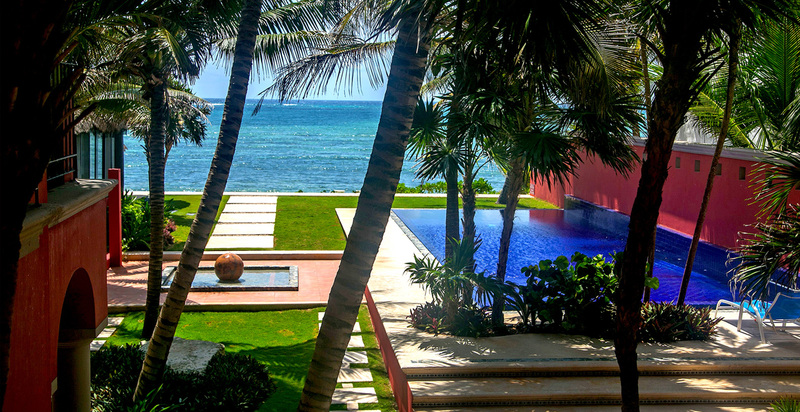 VillaThis exquisite home is located on the Caribbean coast of Mexico, just north of Tulum on the Riviera Maya. Located in in Soliman Bay, this lush tropical paradise offers visitors a haven of peace and tranquility under the coco palms with the of a vast coral reef and warm sandy beach at your doorstep. Villa Zen del Mar is a 4,800-square-foot masterpiece of modern Mexican design. Situated on a private sandy beach in Akumal’s Jade Bay, it has five bedrooms with en suite baths and comfortably sleeps up to 14. On the first floor are a king-size bedroom, living room, dining room, and large kitchen with breakfast bar; upstairs are four bedroom suites with large private bathrooms. Walk into Casa del Sol Naciente and you'll find yourself in a brick-domed, soaring entrance foyer with a Mayan limestone wall. On the first floor is an expansive kitchen, living room, dining room and master bedroom; the second floor is home to four additional bedroom suites. Situated on an 18-foot-high coral dune at the northern end of Tulum, the 12,800-square-foot beach-side estate Villa Esprit del Mar commands breathtaking views of the sea. With NINE air-conditioned bedrooms and 9.5 baths, the villa boasts 25-foot windows to frame the spectacular views. Villa Sol y Luna is a full-service villa conveniently located half an hour drive from Cancun Airport. Our on-site staff, a bilingual concierge and a chef will help you enjoy this unique location for a once-in-a-lifetime vacation. 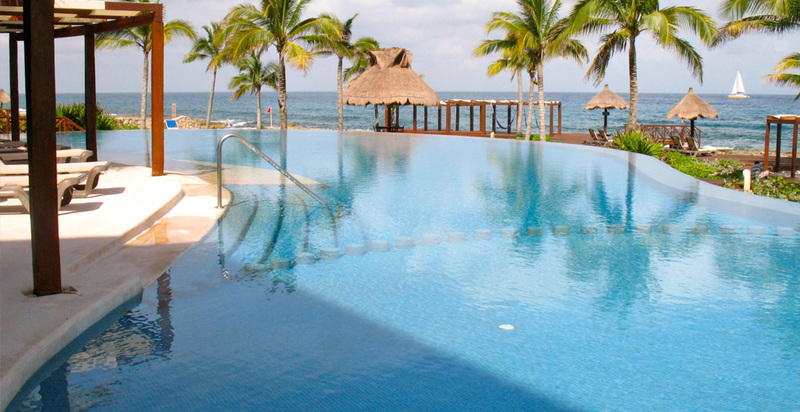 Hacienda Corazon, Puerto Aventuras is nestled in the soft white sands and lapis waters of the Fatima Bay Beach. Hacienda Corazon "House of Hearts" is an incredible one of a kind villa! From the moment you walk through the villa gates you will be enchanted, the heart shaped tropical garden complete with cenote leads to the impressive villa. Lol-Beh is a luxurious 12 bedroom beachfront villa in the Mayan Riviera. It is located on the white sandy beaches of Soliman Bay. With 8600 sq. feet of space, high ceilings, spacious rooms, private pool, and a rooftop terrace which gives a 360 degree view of the entire bay. Villa Hacienda del Mar, Puerto boasts 10,000 sq ft of pure luxury with 11 Suites (10 bedrooms and a den). There are 7 bedrooms in the main villa and 3 bedrooms plus den in the casita (little house) located in the grounds. The magnificent villa located right on the sandy Fatima Bay beach in Puerto Aventuras, is just one hour south of Cancun.